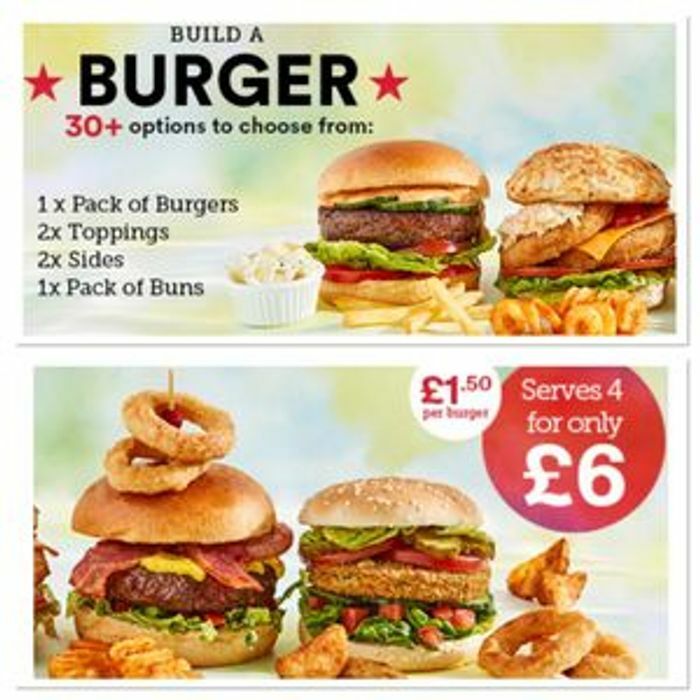 Choose a pack of burgers including vegetable, hot and spicy quarter pounders, lamb, chicken, Aberdeen Angus Quarter pounders or double cheeseburgers. Add 2 toppings from choice including Heinz ketchup, cheese singles, salad selection pack or 5 rashers of unsmoked bacon. Then your choice of bun including 12 pack burger buns, 4 cheese topped rolls, brioche buns or soft white rolls all for £6! Online exclusive £5 Build a Burger deal: choose one burger product, two toppings, two sides and one bread product out of a selection of the following products: Iceland 4 Vegetable Burgers 320g, Iceland 4 Hot & Spicy Sriracha Quarter Pounders 454g, Iceland Luxury 4 Aberdeen Angus Quarter Pounders 454g, Iceland 4 Double Cheeseburgers 454g, Iceland 4 100% British Beef Quarter Pounders 454g, Iceland 4 Minted Lamb Quarter Pounders 454g, toppings of Kerry 15pk Cheese Slice, Iceland 8 Thick Cheese Singles 200g, Mrs Elswood Burger Gherkins Pickled 670g, Heinz Burger Sauce 230g, Woeber’s Genuine American Yellow Mustard 453g, Heinz Tomato Ketchup 342g, Iceland Salad Selection Pack, Iceland 5 Rashers Average Unsmoked Back Bacon 150g, sides of Iceland Luxury Coleslaw 300g, Iceland Potato Salad 500g, S l d:s Luxury Reduced Fat Coleslaw 300g, Iceland American Style Southern Fried Wedges 1Kg, Iceland Thin & Crispy Coated French Fries 1.25Kg, Iceland Curly Fries 650g, Iceland Southern Fried Chips 750g, Iceland Criss Cross Fries 600g, Iceland Battered Onion Rings 670g, bread products of Iceland Luxury Cheese Topped Bread Rolls 4 Pack, Iceland Luxury Soft White Bread Rolls 4 Pack, Iceland Luxury Five Grain & Seed Bread Rolls 4 Pack, Iceland 12 White Burger Buns. Offer valid to 21:59 on 18.04.18. Available for delivery until the 24.04.18. Subject to availability. Whilst stocks last. Products can be purchased individually at their standard advertised prices.